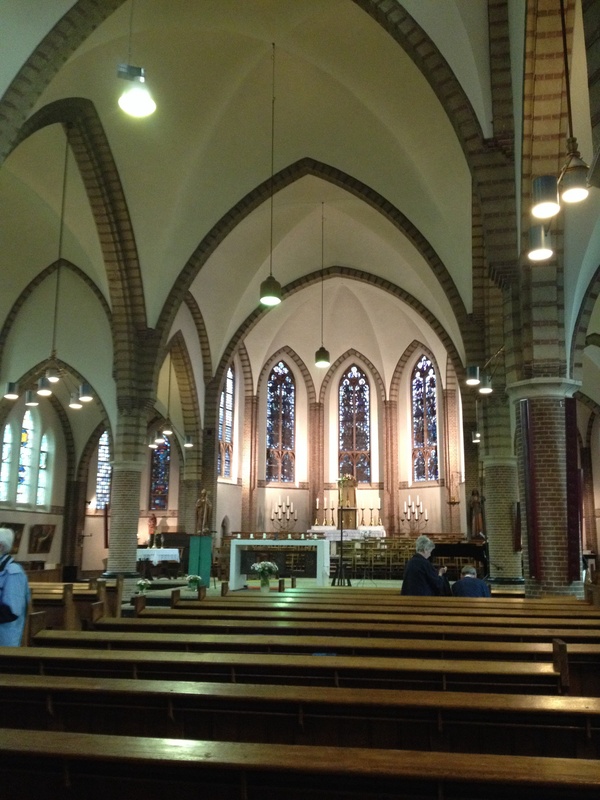 Several weeks ago I mentioned to friends on Facebook that although I would manage to attend church on most of the Sundays of my summer vacation, the Sunday I would be in the Netherlands would be a ‘churchless Sunday’, since I had never been to church on my annual visit to friends there. Apparently in saying this I threw down some kind of cyberspace gauntlet, and was informed quite speedily that I was mistaken and that we would, in fact, find a church service to attend. I must say, for the record, that this wasn’t meant to be any kind of challenge or rebuke, and I was even looking forward a little to having an opportunity to think about what a Sunday without church was like. It just turns out that it wasn’t to be last Sunday. My super-efficient friends easily found out which of the seven churches in their diocese would be holding services, and we had two choices. We decided to go to St. Ansfridus, where there would be a service at 11am. You have probably not heard of St. Ansfridus, or St. Ansfried; this is the only church in the world dedicated to him. He was Bishop of Utrecht from 995 to 1010. After his wife died he wanted to become a monk but instead was made Bishop. He founded two abbeys (including one where his daughter was Abbess). Towards the end of his life he went blind, and was finally allowed to become a monk. Before I go any further, I have to say that St. Ansfridus is a Roman Catholic church, and I do not speak Dutch. It all sounds rather promising, doesn’t it? I am blessed with many wonderful friends, and my Dutch friends are particularly so. Not only did M and S get all of us to church on time (involving two small children and someone having to get there by bike) but M made sure I knew what was going on by giving me translations of a lot of the remarks, prayers and homily. She also checked beforehand that it would be all right for me to receive a blessing when everyone received communion. And now I have to admit a great deal of ignorance when it comes to how the Roman Catholic Church operates in some European countries (I am told this is true of the Netherlands, France and Germany). I must say, I really like Pope Francis, but there are plenty of things I could happily list that I don’t like about the Roman Church, and chief among them would be the patriarchal nature of the hierarchy, and the refusal to allow women to be priests. So it was with total, utter amazement that I attended this service, which included communion (with consecrated host) led completely by women. There was a small choir and their leader was a man, but apart from that, everything was done by women. Yes, really. The woman who led the service was called Josephine and she was a ‘pastoraal werker’ or pastoral worker. The translation doesn’t help much because the term doesn’t seem to exist in English, so I will try as far as I understand it to explain it. Of course, there are priests, but this particular parish of seven churches only has one full-time priest and one part-time priest. There are also deacons. And then there are pastoral workers who are not ordained, but have studied at some kind of theological college and work full-time for the church. While they can’t celebrate the Eucharist, they can provide communion for the people using already-consecrated host, and this is what happened on Sunday. They can also, at the discretion of the parish priest, officiate at baptisms and funerals. When they lead services they are vested and preach. They do far more than what in Anglican churches is called a Lay Eucharistic Minister (LEM). This is a job they do during the week too, visiting the sick and housebound and sharing in the ministry of the parish. Back to the service last Sunday. The service began with some remarks about the terrible things we see going on in the world, and our confusion that they even happen at all. Then followed hymns (familiar tunes so I sang along with the verses I could remember), reading from the Bible (by another woman), a homily and prayers. It was all thoughtful, prayerful and rather lovely. With M providing translation as we went along I felt I understood quite a lot. One challenge was to find where we were in the booklet and leaflet. The booklet was one issued by the diocese for use by every church that day, and the leaflet was specifically for St. Ansfridus. We seemed to jump around in the booklet but M kept up and made sure I knew where we were. A lot of the service seemed to be familiar elements. At the communion, the pastoral worker and the woman who had read the Gospel both administered the host, and although there must have been fifty or sixty people it was all done very speedily. Of course, there was no chalice. When it was my turn I received a blessing. It has been a long time since I received a blessing instead of communion, but I found it meaningful and moving. After the service we had coffee and I had an opportunity to meet Josephine and hear a little about her work. There was another pastoral worker present and he was the one who said the same system exists in France and Germany. I was at once amazed that I had no idea this happened and also sorry that I had assumed the Catholic Church didn’t allow women to do anything like this. So, as far as a welcome is concerned, I was welcomed very warmly, and as a non-Dutch-speaking, non-Catholic I felt very comfortable. There were no greeters, ushers or sidespeople. Everyone seemed to know what to do and picked up everything they needed. They also put money in a basket to pay for the booklet and leaflet used in the service. Afterwards, during coffee, people were helpful but I only spoke to Josephine and briefly a man who knew M from the choir. I certainly knew what was going on and what to do because I had M by my side explaining and guiding me, for which I am extremely grateful. If she hadn’t been there then I would have understood what was going on (the Gospel, the Creed, the Lord’s Prayer, receiving communion) but I wouldn’t have known what was said in the remarks, prayers or homily. The music was printed in the papers we had, but the challenge was finding where they were. The choir leader conducted the people as well, and everyone seemed to know what to do. I left St. Ansfridus feeling very grateful that I had friends who had been determined that I not have a ‘churchless Sunday’, that I had received a warm welcome and could worship with them. The congregation was in great part elderly, with very few people under fifty. The building itself was lovely; not stunningly so but a beautiful, peaceful place to be. Unfortunately, with falling numbers and not enough people to lead services, the church could be closing soon. It was an eye-opening experience for me. It turns out the Catholic Church is not at all how I thought, at least in some European countries. What a wonderful, churchful Sunday it was. This entry was posted in Travel and tagged Catholic Church, France, Germany, Holy Eucharist, Mass, Pastoraal werker, Pastoral worker, Roman Catholic, Roman Catholic Church, St. Ansfridus, St. Ansfried, The Netherlands, Utrecht, welcome by tokyopurplegirl. Bookmark the permalink.